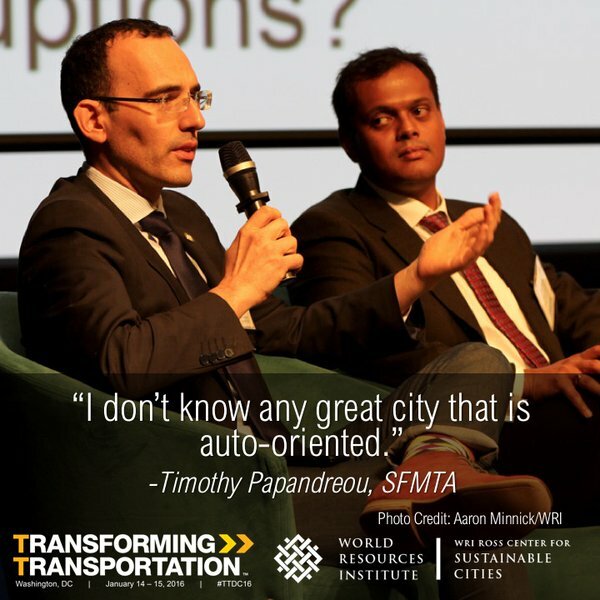 “Transport is a derived need that comes from how the city is laid out,” remarked Victor Vergara, introducing the session Building Compact Cities by Integrating Land Use and Transport Planning, and explaining how a city’s transport needs are a product of its urban form. One reason why urbanization is resulting in sprawled and disconnected communities is that transport and urban planning too often happen in silos. Indeed, highways are often built without consideration for development needs. Integrating transport and land use planning allows cities to plan for expansion and ensure that development occurs in a connect and compact way. For example, Guilherme Medeiros, Coordinator for the Greater Florianopolis PLAMUS, explained how the sustainable mobility plan of the Florianopolis is working to overcome the unique geographic challenges of the metropolitan region. Although the city of Florianopolis sits on an island and serves as a job hub for the region, most people live on the mainland in dispersed suburbs and experience severe congestion during commutes. This makes careful transport planning essential, but also a challenge, as it must take into account development patterns and reach across multiple jurisdictions. Building on Brazil’s law requiring mobility plans from cities, PLAMUS is an attempt to bring transport and development concerns together and plan for the future. Luong Minh Phuc, Ho Chi Minh City’s Director of BRT, explained how the city is planning for expansion by designing a bus rapid transit (BRT) corridor that can meet current and future development needs at the human-scale. With workshops engaging the public and diverse stakeholders, the corridor is aiming to be a quality example of inclusive transit-oriented development (TOD) and will focus on pedestrian accessibility and ridership. This is particularly important for a congestion-burdened city that has nearly 7 million motorcycles. How Do We Improve Safety for Women on Public Transport? Women’s safety in public transport was a defining topic of the second half of day one, breaking down the harassment women regularly experience on transportation. Amit Bhatt, of WRI India Sustainable Cities, noted the primary problem: that there’s “no institutional capacity to address women’s safety” in many countries across the world. The data appears to substantiate this claim. According to research by speaker Morgan Campbell of Rutgers University, 100 percent of women surveyed in Indian cities had reported some kind of harassment or violence while riding public transport. Moreover, as Annie Chang of WRI Ross Center for Sustainable Cities explained, women of lower socioeconomic status were disproportionately affected by unsafe conditions on public transport. While a complex issue, speakers did offer solutions to decrease violence against women. Yasemin Irvin-Erickson of Urban Institute is working to develop a mobile app called ReCap, which allows users to capture real time fear levels and perceived risk on public transport. To be used in Lagos and Lahore, the piloted app seeks to gather data on which stations and areas women feel most unsafe, and take the appropriate action. Gladimir Nascimento, of URBS Curitiba, spoke on his work using artwork and posters on buses to empower women to speak out about abuse. The project also improved lighting in more than 6,000 bus stops to improve safety conditions during the night. Development banks and leaders in the private sector discussed ways that governments and businesses can work together for sustainable change. Beginning the session was an analysis of how COP21 has impacted businesses. 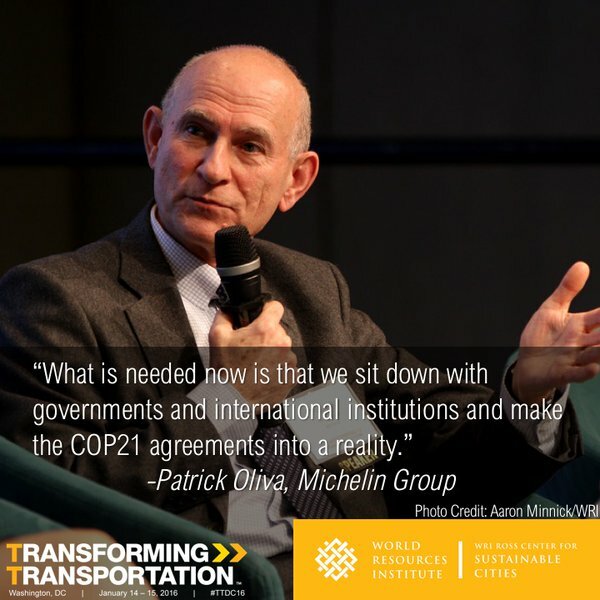 Patrick Oliva, Senior VP of Michelin Group explained that the agreement in Paris has spurred businesses into action: “The power of innovation in the private sector is going to be unleashed [by COP21].” Patrick Oliva said that businesses were excited to play a role in the global fight against climate change, and saw the climate agreement as a major opportunity. Business leaders expressed a similar sentiment on the topic of government regulation: “Set higher standards for us. We want it,” said Miller Crockart, VP of Global Sales and Marketing at PTV Group. 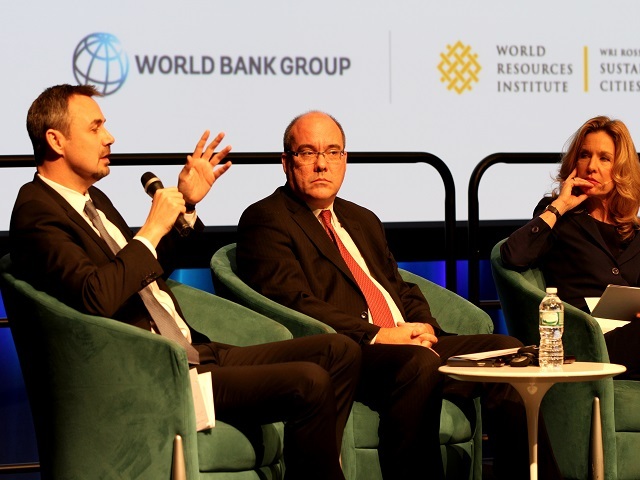 Speakers stressed that ambitious regulations are key for pushing businesses to innovate; however, it’s key that governments allow the private sector to find their own ways to meet goals, instead of being prescribed pathways. Moreover, the business leaders drew a sharp distinction between over-regulation and smart regulation, asking policymakers to keep regulation concise and in tune with what corporations can handle. Rather than seeing decarbonization in transport as harmful to businesses, the private sector leaders saw the two as complementary: “if you decarbonize smartly…you will have a competitive advantage,” said Mitch Jackson, VP of Environmental Affairs and Sustainability at FedEx Corporation. Julia Thayne, Director of Urban Development at Siemens, echoed this notion, declaring that the group would be carbon-neutral by 2030. Wrapping up Day 1 of Transforming Transportation was the Lee Schipper Memorial Scholarship presentation, featuring Gwen Kash, winner of the scholarship and a student at UNC Chapel Hill. The Scholarship is aimed at expanding the contributions to research and policy dialogue in the field of sustainable transport and energy efficiency, with a special emphasis on “iconoclastic” contributions that have clear, transformative outputs and contribute to measurable changes. Kash analyzed the experience of riders on Bogota’s BRT system, TransMilenio. With 710 transit users surveyed, Kash found that travel times, crowding, user culture and crime were among the most common complaints; furthermore, 38 percent of all women had reported being sexually assaulted on the BRT system.